Pollen & Bleu @ Farrer Drive is a new condominium developed by Singland. Pollen & Bleu consists of various unit mix ranging from 1 bedroom to bedrooms as well as penthouses. TOP expected to be in 2018. Developed by Singland, no expense is spared to provide Pollen & Bleu residents the dream home that they truly deserved. Pollen & Bleu is designed for those who appreciate quality of life with a cosmopolitan city fringe address, yet nestled in a quiet enclave of Farrer Drive. Designed with family in mind, each unit in Pollen & Bleu is designed with maximum comfort in mind with spacious layout and North-South Orientation layout for maximum ventilation. Spacious living room, spacious master room and individual bedroom are in place for you the comfort of you and your family. Brand electrical appliances together with top quality finishing are in place for the prestige and comfort for you and your family. Cook your family favorite meal, gather with your family over a TV show or simply laze by the balcony as you appreciate the quiet enclave at Farrer Drive. Latest state of art condo facilities is equipped for the leisure of each residents at Pollen & Bleu. Enjoy the exclusivity and leisure as you gather with your friends and family over a BBQ, swim or just simply laze and admire the sky while lazing by the pool deck. Nearby Renowned Schools include Nanyang Primary School, St Margaret School, Henderson Secondary School, Bukit Merah Secondary School, Republic Polytechnic, Oversea Family School and ACS International etc. Pollen & Bleu - You simply deserve the best. Situated along Farrer Drive, heading to anywhere is simply a breeze. 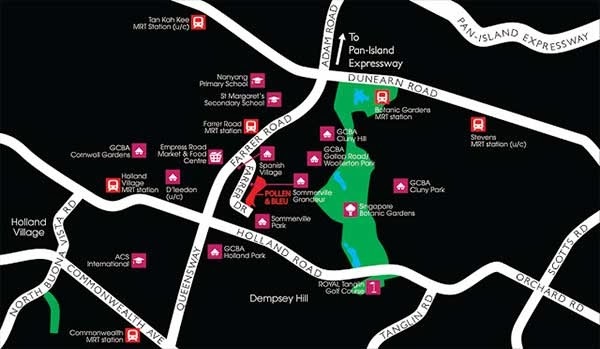 Head on to Orchard Shopping Belt, Dempsey Hill, Holland Village, Empress Road Market & Food Centre. Where for dining, shopping or entertainment experience, you are well covered with an address at Pollen & Bleu. *Pollen & Bleu VVIP Preview is available strictly by Appointment. Showflat opening hours may varies. For opening hours, do call our Sales Hotline at 6100 0877 or register below for your VVIP Preview.